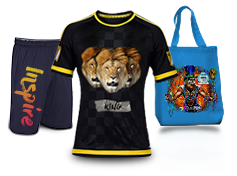 The Best Print Quality in Industrial DTG. 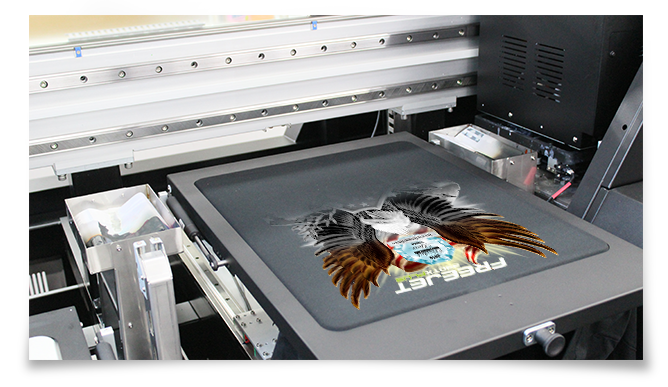 With quality prints up to 1800dpi, the Cheetah is the fastest industrial direct to garment DTG printer that also boasts the highest print quality. 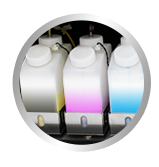 Our Industrial bulk ink system saves you money by eliminating costly cartridges. 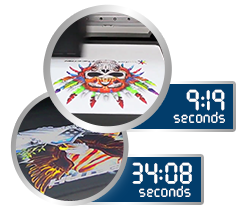 The combination of buying ink in bulk containers coupled with the highest quality Direct Rip Software reduces your production costs. The cheetah is fast...really fast. The Cheetah was designed to run 24x7 in a reliable way. Our bulk ink system allows for reliable non stop operation with inline degassing, filtering, and ink management that is trouble free. The Cheetah was designed with productivity and output in mind. The individual platens can be configured to work independently. This means that when an operator is unloading one garment, the industrial digital t shirt printing machine is busy printing the next garment, thus increasing productivity. 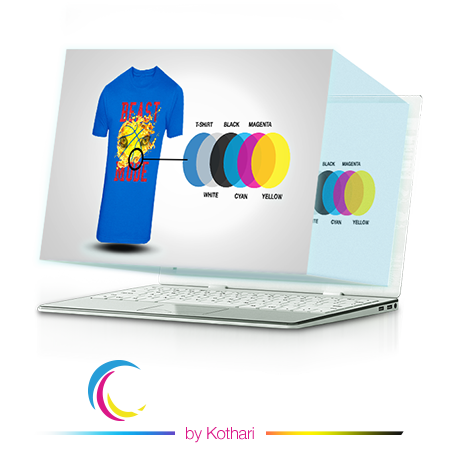 The True OnePass allows dark garments to be fully completed without the need to return to do the cmyk layer. 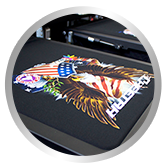 The white print heads and color heads are tuned to work together to print the base and colors at the same time so that each garment being printed is finished in one pass. 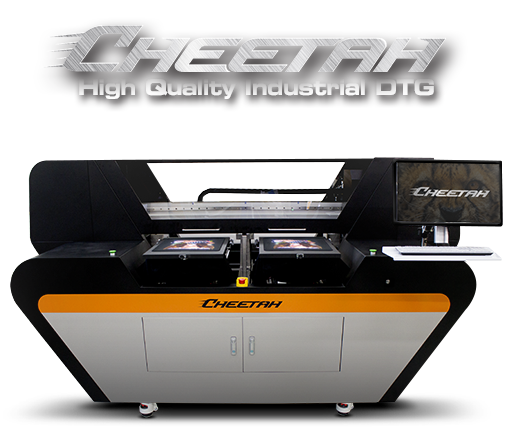 The Cheetah can produce a heavy workload in a fraction of the space required by traditional silk screening equipment, thereby increasing the revenue that can be generated by your workspace. 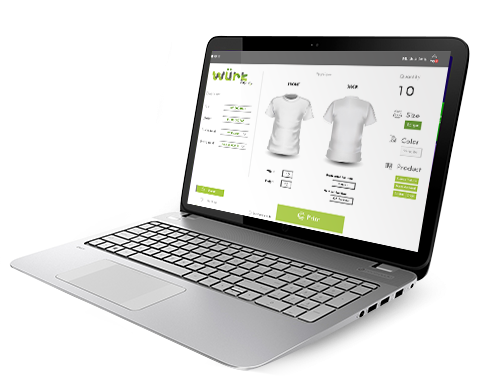 We have partnered with Wurk™, a comprehensive web-based production management solution that enables a truly automated direct to garment process from picking blanks to shipping a complete order. Wurkflow re-imagined™. 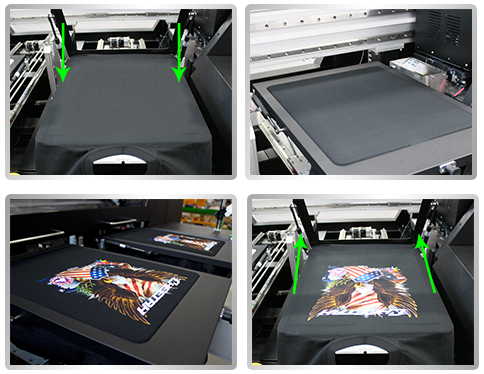 The game-changing innovation that reduces your production cost while improving image quality. Save an average of 28%* in ink costs!